MOSCOW --- The Russian Northern Fleet’s flagship heavy nuclear-powered missile cruiser Pyotr Veliky has entered the Barents Sea for accomplishing combat training missions, the Fleet’s press office reported on Wednesday. This is the warship’s first sortie in the new combat training period, the press office said. 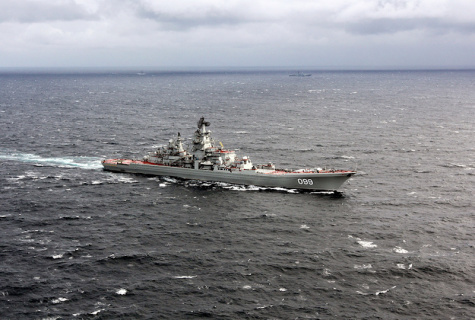 "The cruiser’s crew will practice some elements of the surface ship’s readiness at sea and carry out an attack against a submarine with the firing of anti-ship missiles," the Northern Fleet’s press office said. "The cruiser’s crew will perform the combat exercise with the practical weapon, striking the target whose role will be played by one of the vessels of the Northern Fleet’s submarine force," the press office said. After accomplishing its missions at sea, the Pyotr Veliky will return to the Fleet’s main naval base of Severomorsk. The Pyotr Veliky is the Russian Navy’s sole operational third-generation Project 1144 ‘Orlan’ heavy nuclear-powered missile cruiser. It was laid down at the Baltiysky Shipyard on August 25, 1986 and floated out on April 25, 1989. On April 18, 1998, the warship entered service with the Russian Navy and the St. Andrew’s naval flag was hoisted aboard it. Project 1144 ‘Orlan’ (NATO reporting name: Kirov class) battle cruisers are the Russian Navy’s first and sole nuclear-powered surface ships. The warships of this Project are the world’s largest non-carrier strike combat ships.